Ever think your spouse would come home and say it’d be cool to own a couple llamas? Dawn Bishop didn’t know what she was getting herself into when her husband, John, proposed the idea. The couple started out exercising llamas at the New York State Fair, before eventually ending up with a llama trekking business in central New York state. 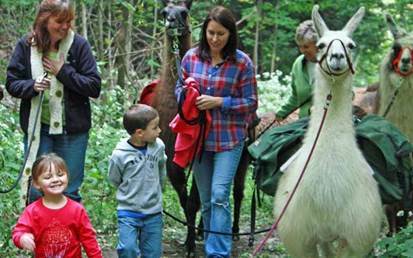 Click here to read all about Llama Trekking in Central New York State. Learn about owls. Then explore the refuge looking for them. 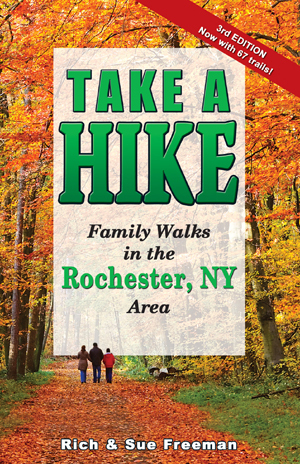 Pre-register: 585-948-5445 ext. 2205 or megan_davis@fws.gov. It’s a snake! Call 911! Good thing we didn’t meet another questioner, though I don’t think we‘d have insulted even the most gullible tourist with such a tale. But for the rest of our hike we had fun elaborating on the story. I’ve always wondered why so many otherwise rational folks hate and fear snakes. True, there are venomous serpents that deserve cautious respect. Massachusetts (though not Mansfield) has two such species, the timber rattlesnake and the copperhead. The former lives in isolated rocky areas on Great Blue Hill and in several other spots kept secret by herpetologists. The copperhead is almost never seen. I’m told that no one ever has died from the bite of a Bay State serpent. The juvenile milk snake with its reddish markings is sometimes taken for a copperhead. I recall when a newspaper in a nearby town front-paged a photo of a firefighter posing like a big game hunter with a “copperhead” he’d vanquished. Next day’s paper pictured a zoo keeper smilingly fondling an identical but live serpent, which he correctly identified as a harmless milk snake. A Mansfield woman once told me, with an embarrassed laugh, how she’d found a garter snake in her basement. She summoned her husband, who took one look and phoned the police. The cop, on arrival, was equally timid. All three were standing around the inoffensive creature when a daughter arrived home from middle school and clobbered it with a shovel. Some people who walk in Mansfield’s woods tell me they avoid swamps “because that’s where snakes live.” This old swamp Yankee has never seen a snake in a swamp. The water snake, incorrectly called water moccasin, lives in our streams and often ventures on dry land but not swamps. One local serpent that looks evil but isn’t is the hog-nosed snake, also called the puff adder. Disturb it, and it hisses, inflates like a bicycle tire and even strikes but won’t bite. If that bluff doesn’t scare you off, it rolls on its back and plays dead. Some non-poisonous snakes will bite. My uncle Bill Chase, a state game warden, was demonstrating how a four-foot blacksnake, if coiled and placed on its back, wouldn’t move as long as it stayed in that position. The snake took a dim view of the proceedings, sank its teeth into the skin between Bill’s thumb and forefinger and began chewing. Bill gently worked its teeth free, viewed the pin-pricks on his hand and said, “It’s like a kitten’s bite.” Luckily he never encountered the alleged 12-foot blacksnakes reported by a Mansfield character who’d imbibed too much pink-elephant juice. I don’t think snakes deserved that fate. Besides, this is the Chinese Year of the Snake. Let’s live and let live. 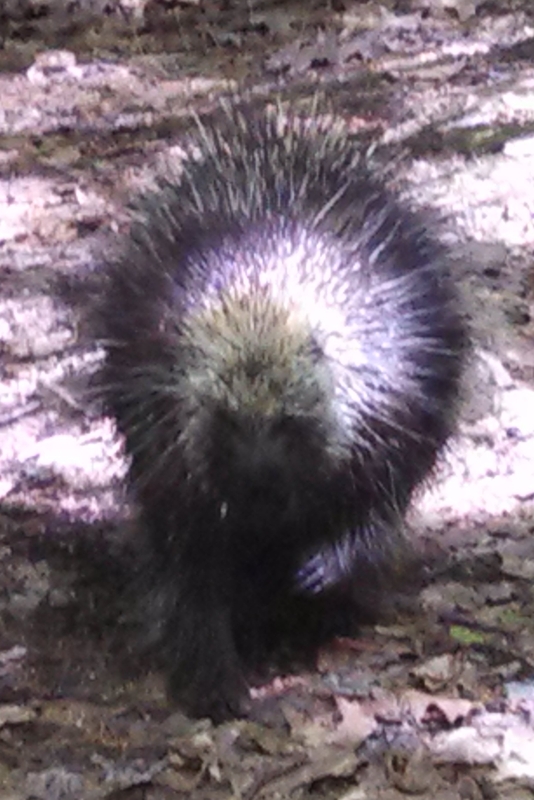 Porcupine ambles down the Finger Lakes Trail. 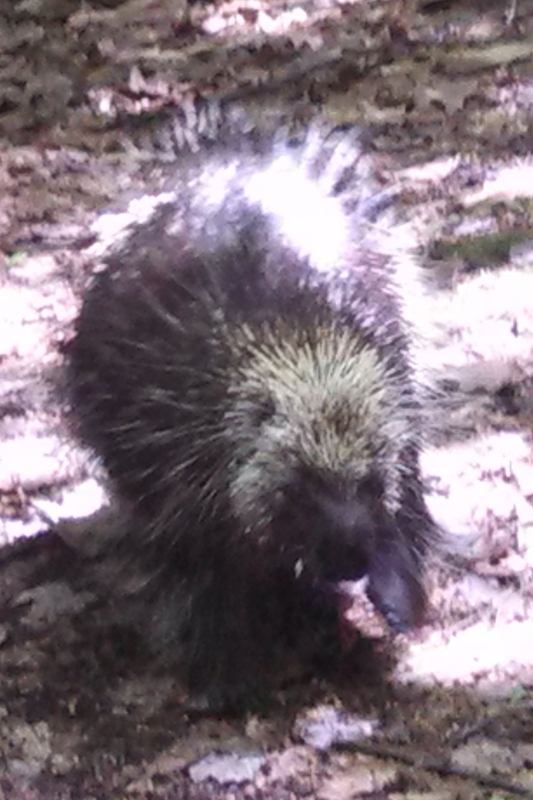 Joe Dabes and others have reported more frequent sightings of porcupines along the Finger Lakes Trail. Generally they’re not much of a threat to humans (they’re more likely to climb a tree and curl into a ball when they see you) but, it’s highly recommended that you keep dogs leashed on the trails. When a dog encounters a porcupine, it’s not a pleasant experience for the dog – often requiring a trip to the vet. Porcupine spots a hiker & puffs up. Sherrie suggested sprinkling Critter Ridder granules under your car (organic and biodegrades) if you’re leaving it near a trail overnight. Porcupines have been known to chew up all of the rubber under the hood of a car (transmission lines, radiator hose, brake boots, etc.). 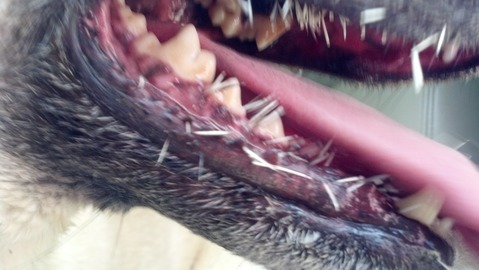 This poor dog met a porcupine & ended up with quills in his snout.